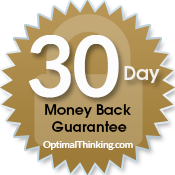 This 50-question assessment (for laptops and tablets only) will empower you to be optimally effective at work, at home, and in all your relationships. After taking the assessment, you will receive your fully personalized 21-page Self-Optimization Report. You can also obtain input from an unlimited number of observers by inviting them to give you feedback. You will then obtain a 360 degree (multi-rater) view of yourself through the eyes of others. You can read your personalized prescriptive 41-page Composite Report online or download and print it out at your convenience. Note: You will receive two emails. One email will confirm your order. The other email will provide your login details. Please look for them in your email inbox. After your payment is approved, your assessment will be activated. 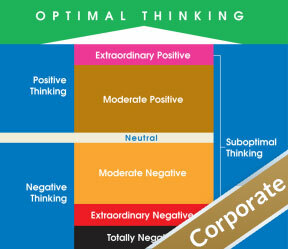 Be sure to approve our domain name, OptimalThinking.com, in your email program. This assessment is designed for laptops and tablets only. It is not designed for mobile phones. Hits the nail on the head. Excellent. Wish I’d taken it 10 years ago. It would have saved me a lot of heartache. Great assessment. Very revealing. The best I’ve taken. I usually don’t like these assessments. I’ve taken many during my career. This is the most insightful. I like the suggestions as well. Great assessment. Helped me to understand myself and how to deal with other people. The best assessment I have taken. Thank you. This assessment is better than Myers-Briggs, Disc and the other well known assessments. It showed me how to think and communicate to be totally effective. Brilliant! Incredibly accurate assessment. I learned so much about myself and how others think and act that I have already used to great advantage in my relationships at work and home.